Termite mud tubes are often on concrete foundation walls, but also poke through drywall and hang from ceilings. Termite swarmers are looking to start a new termite colony by finding a new home and mating! They usually are seen after monsoon storms or heavy rain. Termite Season in Arizona heats up during the Spring and goes strong through Summer & Fall! Cracks in your foundation. Termites only need 1/32 of an inch to access your home. Moisture – Termites seek moisture. Fix all leaky pipes and watering systems. Divert all moisture AWAY from your home. Make sure your not over watering. Soil around your home should be well drained, and allowed to dry. 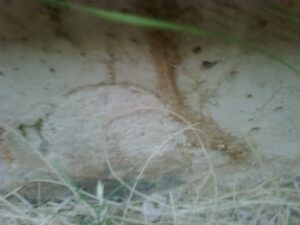 Constantly moist soil is a “Welcome” sign to Termites and other pests! Scrap wood (Termite Bait) around your home and yard. Keep firewood at least 20 feet away from your home. Direct wood to ground contact. (Including fences or other structures that contact the soil and the home.) Dig back all soil that contacts the stucco or wood parts of your home. Providing Termite Pest Control in Mesa, Phoenix, Chandler, Gilbert, Glendale AZ & surrounding areas!